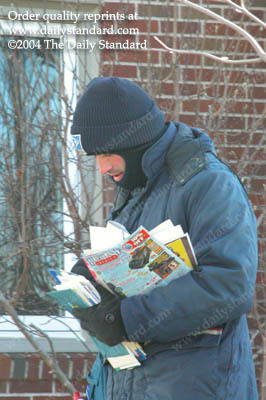 Minster postal carrier Scott Armstrong is bundled up as he delivers mail in the village on Tuesday. Temperatures dropped throughout the day from a high of 33 in the morning to an overnight low of 4 degrees, according to the National Weather Service. Armstrong said the cold weather doesn’t bother him on days when the sun is shining, “But that wind could die down anytime now,” he laughed, as he scurried on his way. The Grand Lake St. Marys area has seen a roller coaster of temperatures in the last few weeks — remember Saturday’s high of 59? Unfortunately, forecasters predict at least another 15 days of the current cold spell.